As a Protestant, I was known as a “soul-winning,” faith-sharing fiend among the pastors in our association of churches. My denomination hosted a toy store missionary outreach every Christmas, in which community members in financial straits could “shop” for their families for free. Hundreds of volunteers assembled at the First Denominational Church in our town. Classrooms on a long hall of one wing of the education building were packed with toys, clothes, and household items. At the opposite hall, a row of smaller classrooms formed the bar of the “T,” in which religious counseling was offered for the guests who consented. Since there was no exit from the building except at that end, we counselors stationed ourselves there as “angels” who helped guests to their cars with their gifts. I was both the rare female, and only faith counselor under the age of thirty. Every annual group of pastors serving as counselors commended my effectiveness and missionary zeal. I would ask with a bright smile to mitigate the confrontation. And because I could show them chapter and verse as I led them through a concise faith-sharing model, I led many a Catholic away from the Church. Now, with head and heart and faith now fulfilled in the Church, remembering the blank stares and complete inability of even a single Catholic to answer my zealous presumption concisely is what motivates my entire ministry. I know you long to be able to explain this glorious, ever-ancient, ever-new faith we call Catholicism in a way that will not only intrigue, but inspire others to investigate and embrace the Church more fully. Because I was once an adversary, I know how to equip you to lead Protestants home. I know their expectations for explanation lie in the Bible. I know there is no way to share the Catholic Faith with most Protestants convincingly without using the Bible. But it has to be a simple formula. Your love for and knowledge of the Faith, combined with a concise way to share it, is the answer. If you know and love your faith, and are able to share it simply, you will help lead Protestants home. The Old Testament tabernacle is the biblical foundation for Catholicism. As such, it is the perfect faith-sharing model for Catholics, as simple as drawing a sketch of the Tabernacle layout, and explaining how each element remains perpetual as God commanded by its fulfillment in the Catholic Church. The Catholic Church is the only Church on the face of the earth that obeys God’s command that every element of tabernacle worship be maintained forever. The Tabernacle shows us how Jesus gave the Old Testament new life in his person. Just as Jesus’ death, resurrection, and ascension into heaven were not the end, but the beginning of the Church; just as Jesus’ physical body was fulfilled and yet remains; the Old Testament was fulfilled and yet remains in his mystical body, the Church. The blueprint of the Old Testament remains the template of the New. Like Jesus’ almost unrecognizable resurrected body (John 20:14), the old practices and prescriptions, in him, are dead and resurrected, changed and filled with supernatural saving grace. Through the Church, Jesus would not just tabernacle among men, as in the Old Testament and the tabernacle of his own body, but tabernacle in men, through his body the Church, itself a living tabernacle (1 Peter 2:5). The Old Testament Tabernacle was prescribed by God himself in order to instruct his people in proper worship. The Tabernacle foreshadowed worship in the Church and in heaven. The Tabernacle was meant to be the structural basis of all Christian worship and practice. Both Old Testament and New Testament worship are modeled after the worship occurring in heaven right now, as seen in the prophetic books, and reflected in the individual soul. A portable tent-like structure and a surrounding external courtyard, the strictly prescribed Tabernacle setup informed the Israelites that they could only come to God in the way he offered. There was no other way. God used the Old Testament Tabernacle to tell us that we, too, can only come to him most fully through the way he has provided for us — the historical Church in Jesus Christ. The shape of the layout is the Cross of Christ. The Church imitates this cruciform shape and proportions in her individual churches. Jesus said he did not come to cancel the Old Testament, but to give us the grace to keep it more perfectly than just our outward behavior, so that we ourselves also fulfill the Law, in him (Matthew 5:17-19; Matthew 9:16-17). Jesus came to build something gloriously new on the foundation of the old structure. As the New Tabernacle, he imbues the New Covenant with a new spirit. He teaches us their proper orientation and meaning and gives it all saving power. The Old Covenant is not canceled, as in tossed out as “wrong” or “bad,” he says, even in its minutia. In fact, Jesus offers his gravest warning to anyone who would simply relax, much less eradicate, even one detail. Instead, Jesus gathers in, upholds, and expands the entire Old Testament, in every detail, into and beyond himself. In his person, even until the end of heaven and earth, he brings it forward and fills it with a breath and grace that makes the new structure alive, and therefore capable of salvation. Here are the important elements of the tabernacle and how they apply to us in the Church. First and foremost, the Church is the final, eternal Tabernacle of God as Christ’s mystical body (Revelation 21:3). Because the Church is the “dwelling” or Tabernacle in the New Testament, as St. Paul says, it is therefore the foundation of truth (1 Timothy 3:15). Because the Church is made of individual Christians, you also are a living tabernacle of God. For God to feel completely at home and dwell most fully in us, every worship element of the Old Testament Tabernacle should be reflected in our own lives. The fullness of the faith has been preserved in the Catholic Church so that each prescribed element is present in the faithful Catholic’s life today. Through our liturgical year, we “keep time” with God and all the saints and angels of history, present, and future. As in the Old Testament, our special days include rest, offerings, and a sacred assembly. Holy Days and Feast Days are special because they remind us of important salvation events in our history with God. Jesus fulfilled the Old Testament feasts, so our holy days revolve around him and his life and ministry—Sunday, Christmas, and Easter—and those saints who served him most extravagantly. St. Paul tells us plainly to “keep the feast” (1 Corinthians 5:7-8). Every Catholic holy and feast day is centered on the New Covenant himself, in the Eucharist. As the Old Testament and Ezekiel’s prophetic messianic temple prescribe, there is both an institutional and lay priesthood in the Catholic Church. “and like living stones be yourselves built into a spiritual house, to be a holy priesthood, to offer spiritual sacrifices acceptable to God through Jesus Christ…. But you are a chosen race, a royal priesthood, a holy nation, God’s own people,that you may declare the wonderful deeds of him who called you out of darkness into his marvelous light.” (1 Peter 2:5,9). Our Catholic priesthood serves God’s people through the new sacramental economy founded on Christ in the Eucharist. Every Christian is also called to a form of priesthood. We lay “priests” can offer all of our sacrifices in union with Christ for the good of souls. Because Jesus appoints his priests and rules through our Catholic priesthood, to obey Church leadership is to obey Christ (Romans 13:1-2). The brazen altar in the Tabernacle was the location for all the bloody, burnt offerings. Jesus is both our High Priest and Victim. He is the ultimate sacrifice; the perfect Lamb of God who takes away the sins of the world. The Cross is his altar and ours too. Following in the sacrificial footsteps of Christ, we can offer up our own sufferings as a sacrifice to God for our good and the good of souls. Remember Eucharist means thanksgiving? We give thanks for that ultimate sacrifice by taking up the chalice of salvation and calling on the name of the Lord, as Psalm 116:12-13 says. “For our God is a consuming fire” (Hebrews 12:29, emphasis added). “Set me as a seal upon your heart, as a seal upon your arm; for love is strong as death, jealousy is cruel as the grave. Its flashes are flashes of fire, a most vehement flame” (Song of Songs 8:6). The “fiery trials” and sufferings we experience in our lives are ultimately the presence of God accepting our many daily offerings throughout the primary offering of our whole life: heart, soul, mind, and strength. This fiery Presence purifies us with the strength of his love, and so he is the fire of purgatory. God, himself, is the fire that purifies and saves us (1 Corinthians 3:12-15). All of Christendom agrees that the Old Testament laver foreshadowed ritual baptism. Baptism configures the soul for grace and initiates us into the life of Christ. “Jesus answered, ‘Truly, truly, I say to you, unless one is born of water and the spirit, he cannot enter the kingdom of God’” (John 3:5). The lampstand was symbolic of the light of God’s word through the priesthood and the only illumination in the holy place of the Old Testament sanctuary. Engraved with beautiful almond branches, flowers, and ripe fruit, it remained in God’s presence, symbolizing the almond branch-staff of the high priest. His staff was chosen and confirmed by God as the first high priest and representative of his eternal, institutional priesthood. Jesus is the center of the historical, institutional priesthood of the Church (see Revelation 1:12-13, 20). The Tabernacle lampstand is fulfilled through the Magisterium of the Church. 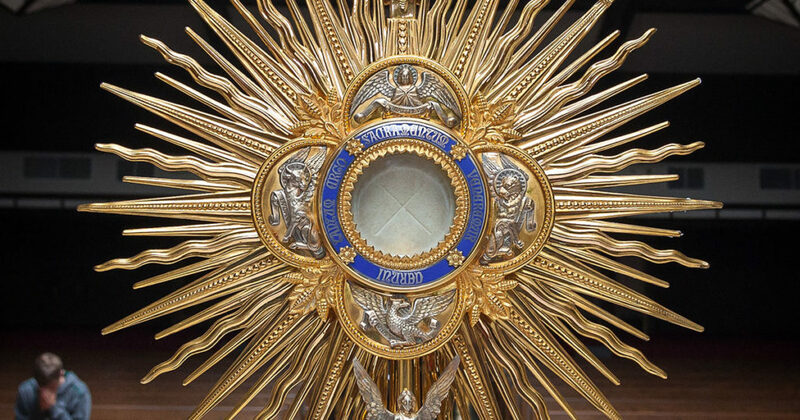 The golden Table of Presence Bread in the Tabernacle foreshadowed Jesus, our “super manna.” The Catholic Church retains the Old Testament teaching of the real presence of God in the Presence Bread through Christ in the Eucharist. The Eucharist is the daily, consistent continuation of God’s command that there be perpetual Bread of the Presence in the Tabernacle. The Tabernacle Presence Bread is fulfilled in the Eucharist. Tabernacle incense foreshadowed Catholic prayer, especially the Mass. Whenever we pray, especially in the Mass (see Malachi 1:11), and particularly when our prayers are most difficult and sacrificial, our prayer ascends to the heavenly Tabernacle before God like incense (see Revelation 5:8-10). He is touched, pleased, and moved by our communal and personal prayers, which are accompanied by those of the angels and saints who are always offering the “incense” of the Church’s prayer to God as a sacrifice. Incense is fulfilled in the Catholic Mass. The Tabernacle veil foreshadowed the flesh. The entrance to the Holy of Holies in the Old Testament Tabernacle was covered by an intricately embroidered tapestry. Woven in vibrant purple, blue, and scarlet threads, and decorated with cherubim, the veil was an artistic rendering of a sacred truth: God’s royal, sacrificial Presence is covered and guarded by a woven veil and angels—in the Tabernacle, in the flesh of Jesus, and our own flesh, in varying degrees. The flesh is the sacred curtain that both veils and reveals God’s presence. The woven Tabernacle veil is fulfilled in human flesh. The Ark of the Covenant was the “footstool” and throne from which God ruled and spoke in the Tabernacle. The early Church gave Mary the title of “Ark of the New Covenant” because of the numerous scriptural parallels between her and the Old Testament Ark. We can welcome God’s protection and direction in our lives especially by welcoming Mary. The Tabernacle Ark is fulfilled in Mary. Jesus gave the Old Testament—the Tabernacle; liturgical schedule; institutional priesthood; sacrificial altar; perpetual altar fire; ritual washings; light; Presence bread; incense; and ark—new life. Jesus’ physical body was fulfilled and yet remains; the Old Testament was fulfilled and yet remains in his mystical body, the Church. Old Testament worship and practice was not faulty. It fulfilled its purpose as the template for the New. Like Jesus’ almost unrecognizable resurrected body (John 20:14), the old practices and prescriptions, in him, are dead and resurrected: transformed and filled with supernatural saving grace. The Old Testament Tabernacle was prescribed by God himself to instruct his people in proper worship. The Tabernacle foreshadowed worship in the Church and in heaven. Fulfilled, Uncovering the Biblical Foundations of Catholicism equips you to help lead Protestants home by giving you a perfectly packaged biblical model for conveniently understanding and explaining Catholic beliefs and practices using the Bible, the most successful tool for reaching most Protestants. Wow! That’s gotta be the best one page catechism I’ve ever read. Thank you!